the inferior surface of the sustentaculum tali. It attaches below and behind to the inferomedial margin of the calcaneus, above to the medial malleolus. The retinaculum is consistent below with the deep fascia (plantar aponeurosis) of the foot and superior with the deep fascia of the leg. Septa from the flexor retinaculum for the tendons of the flexor muscles, while they enter the sole of the foot from the posterior compartment of the leg, transforms grooves on the bones into tubular connective tissue channels. Synovial sheaths, which enclose the tendons that facilitate the free movement of the tendons in the channels. For the tendons of the tibialis posterior and flexor digitorum longus muscles there are two compartments on the posterior surface of the medial malleolus. The tendon of the flexor digitorum longus is medial to the tendon of the tibialis posterior. Immediately lateral to the tendons of the tibialis posterior and flexor digitorum longus. With its affiliated veins, the posterior tibial artery and the tibial nerve pass through the tarsal tunnel into the sole of the foot. Through the flexor retinaculum midway between the medial malleolus and the calcaneus, the pulse of the posterior tibial artery may be felt. Lateral to the tibial nerve is the compartment on the posterior surface of the talus and the undersurface of the sustentaculum tall for the tendon of the tlexor hallucis longus muscle. Anteriorly or superiorly: To the posterior border and tip of the medial malleolus. Posteriorly or inferiorly: To the medial process of the calcaneal tuberosity. tendon of flexor digitorum longus,. posterior tibial artery and its branches,. posterior tibial nerve and its terminal branches. tendon of flexor hallucis longus. The flexor retinaculum resembles the anterior and medial segments of the medial malleolus, at the apex. After passing under the tibialis anterior tendon, the deep aponeurotic component of the retinaculum inserts on the an terior aspect of the medial malleolus. It intercrosses over the superomedial band of the inferior extensor aponeurosis. The superficial aponeurotic component inserts on the deep surface of the superior extensor retinaculum and overpasses the tibialis anterior tendon. From the tip of the medial malleolus to the posterosuperior aspect of the os calcis medially, the posterior border of the flexor retinaculum extends. From the anterior border of the medial malleolus to the medial border of the foot, the anterior border imitates a vertical line drawn. The posterior border is constant with the superficial and deep aponeurosis cruris and the anterior border with the dorsal aponeurosis of the foot. These last two borders are hypothetical because they are in continuity. The base of the flexor retinaculum and the superior border of the abductor hallucis muscle have strong resemblance. Anteriorly, both the superficial and deep aponeurotic components are coalescent. Obliquely oriented fibers are present in the proximal segment of the flexor retinaculum. Posteriorly, there is a division of these two layers., the superficial aponeurotic component envelops the lower segment of the Achilles tendon medially, whereas the deep aponeurotic component of the flexor retinaculum inserts on the upper medial surface of the os calcis. The medial surface of the os calcis is created with this dissociation, which is a triangular space containing adipose tissue and giving passage to the medial calcaneal vessels and nerves. Anterior connection of the fibrous tunnels of the tibialis posterior and flexor digitorum longus tendons is from the coalesced segment of the flexor retinaculum. The deep aponeurotic segment of the flexor retinaculum, with its calcaneal attachment, forms the tunnel for the posterior tibial neurovascular bundle. Anteriorly the distal segment of the flexor retinaculum has vertically oriented fibers. At the level of the superior border of the abductor hallucis muscle, the coalesced aponeurotic layers split and envelop the muscle. The superficial layer is in continuity with the plantar aponeurosis. The deep layer adheres to the posterior segment of the medial intermuscular septum, thus reaching the trough between the abductor hallucis muscle and the flexor digitorum brevis. Posteriorly, the fibers take insertion on the calcaneal posteromedial tubercle. In the lower segment of the intermuscular compartment of the cal-caneal tunnel, a transverse triangular interfascicular lamina is seen. Keeping tendons in their precise location and not letting them dislocate or move away from their respective locations is the main purpose of the flexor retinaculum of the foot, as this may cause problems for the individual in the form of ankle pain and difficulty walking. The Flexor Retinaculum of the Foot acts as a network of tissues and muscles that enclose the entire ankle joint. 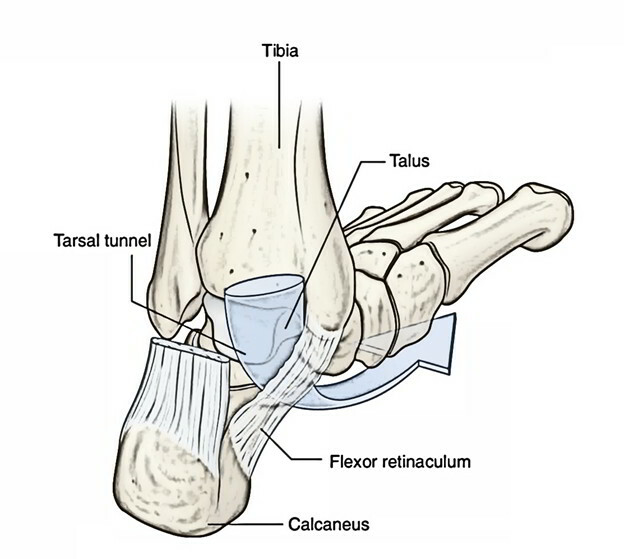 A clinical situation called tarsal tunnel syndrome appears as a result of deep compression of the tibial nerve through the flexor retinaculum (in the osseofibrous tunnel behind the medial malleolus). Clinically, burning, tingling, and pain in the sole of the foot show up afterwards. Surgical division eliminates these symptoms.